You lost the directions for your pocket pedometer, did you? Or the directions have text that's so small it's hard to read? Whatever the reason, we're here to help with Ryan's simple directions for getting the most out of your Omron HJ-303 pocket pedometer. When it comes to tracking your step counts, you want a pedometer that makes this easy. The beautiful thing about a tri-axis pedometer is that you can slip it into a pocket or a bag and just forget about it for the rest of the day. There's no on or off button to worry about. You don't have to worry about it being properly positioned on your belt. It automatically resets your step counts to zero at midnight each night so you don't have to remember to do so yourself. Not to worry, though! It will also store seven days worth of past data! Not readily apparent is that this pedometer is incredibly good at not counting non-walking steps. Cheap pedometers will record a 'step' every time your car bounces over a pothole making it difficult to separate real steps from fake steps. This pedometer won't add such bumps to your day's total unless you walk for four consecutive seconds or more eliminating almost all false positives. That's why you can slip it into a pocket and forget about the pedometer for the rest of the day. This pedometer also has a trip counter allowing you to start counting steps at any time for any length of time. This is quite helpful if you want to measure the step counts of a particular route and for calibrating your stride. You probably won't use this feature often, but it's nice to have handy for the times when you do need it. Adults getting at least a half hour of moderate-intensity aerobic activity five days per week reap significant health benefits, and even an activity as simple as a brisk walk can get you there. This pedometer, therefore, will track 'moderate activity' which generally means walking between 2.5 to 3.5 MPH along with how many minutes of it you've gotten each day. All walking will help your health, but it's nice to check that you're walking fast enough to get the most out of it. This pedometer comes with a strap, a clip and a holder to attach it to your belt. (It also comes with a small screwdriver, but it didn't even fit the screw on the back of my pedometer so let's not worry about that item!) I'm going to go out on a limb and tell you to chuck the clip and the holder. Only geeks wear pedometers on their belt, and only mechanical pedometers need to be worn there anyhow. 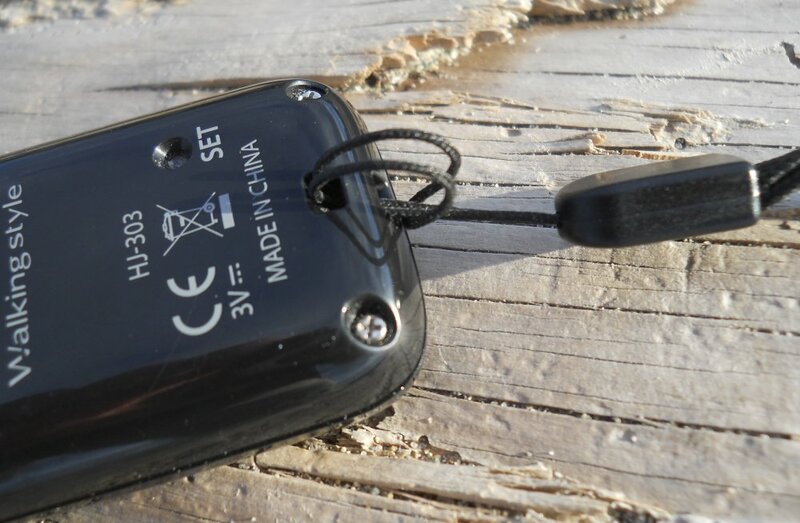 You have a super-duper tri-axis pedometer that can be slipped into a pocket or bag so the holder is useless. The clip might be useful if you store your pedometer where it can fall out of your bag or pocket, but unless you're swinging around upside down on a jungle gym, that shouldn't be a problem either. So ditch those accessories. The strap—I like having the strap. I find it easier to fish the pedometer out of my pocket when a finger hooks onto the strap or I can wrap it around my wrist if I'm carrying it in my hand to measure distances. Strictly speaking, the strap isn't necessary; so use it if you like it, and skip it if you don't. To install the strap, fit the stringy end through the hole on the back, right side of the pedometer. Widen the end of the stringy end into a loop and stuff the fat end of the strap through it. Pull tight and it's attached! How to Measure Your Stride You've got your pedometer and figured out how it works, but you still need to calibrate it by entering your stride. Use this tutorial to learn several ways to measure your stride and which option you should use. 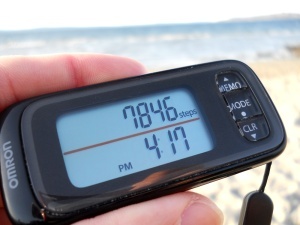 10 Stupid Easy Ways to Increase Your Step Count You've got your pedometer—now it's time to step up that step count! Here are ten easy ways to get started. Fitbit: A Top-of-the-Line Pedometer Another good option if you're in the market for a pedometer—the Fitbit! Even better, you can automatically have your daily step counts sent to Walking 4 Fun. Omron HJ-303 Pedometer Guide The ultimate tutorial for learning about your Omron HJ-303 Pocket Pedometer.